A set pattern of manoeuvres has been incorporated in the Phoenix Model Aviators Inc 'Park Flyers Certificate' to allow the pilot to demonstrate his/her skills in flying this category of model aircraft. 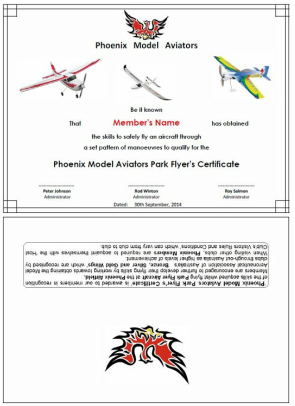 Phoenix Model Aviators Inc 'Park Flyers Certificate' is awarded to a member who can demonstrate the skills necessary to safely fly an aircraft through a set pattern of manoeuvres which includes a smooth and stable landing on the runway in front of the Pilot Safety Barrier. 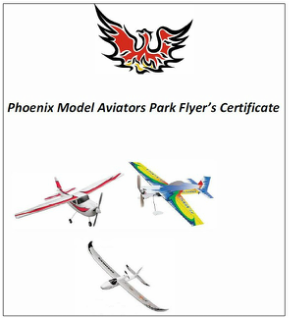 Click on the PDF below to download the Phoenix Model Aviators Inc 'Park Flyer's Certificate' Flight Training Manual. As from 1st. July, 2015, the Model Aeronautical Association of Australia - MAAA, has extended the 'Flight Proficiency Scheme' by providing all affiliated members the opportunity of obtaining three categories of achievement. This category has a higher level of achievement. The 'Bronze, Silver and Gold Wings' are awarded when a member demonstrates that he/she has the skills to perform the required manoeuvres, in a competent manner and to the required standard. as higher levels of achievement. Click on the PDF to the right to download the Phoenix Model Aviators Inc' 'Bronze, Silver & Gold Wings', Fixed Wing Powered - Flight Training Manual.